Although spinal anesthesia avoids the risks involved in managing the airway of the parturient, an undesired side effect often seen is hypotension. Prophylactic intravenous (i.v.) administration of vasopressors such as ephedrine or of serotonin receptor antagonists such as granisetron and ondansetron has been used to overcome this problem. The aim of the study was to compare granisetron and ondansetron with the traditionally used vasopressor 'ephedrine' in reducing hypotension following spinal anesthesia and their effect on sensory and motor blockade in parturients undergoing cesarean section. This study was designed as a randomized, prospective, double-blind, placebo-controlled trial. Eighty parturients of ASA I or II grade, aged 2040 years, scheduled for elective cesarean section were randomly allocated into four equal groups (G, O, E, and C). 'Group G' received 1 mg i.v. granisetron, 'group O' received 4 mg i.v. ondansetron, 'group E' received 10 mg i.v. ephedrine, and 'group C' received 10 ml normal saline. All of the studied drugs were diluted in 10 ml normal saline and administered over a period of 1-5 min before induction of spinal anesthesia. Mean arterial blood pressure, heart rate, sensory and motor blockade, nausea, shivering, bradycardia and vasopressor need were assessed. The reduction in mean arterial pressure was significantly lower in the therapeutic groups, with the best results recorded in the O group and nearly comparable results in G and E groups. Heart rate was statistically different only at 10 and 15 min. No significant difference was seen in motor block or in the incidence of bradycardia. Significantly faster recovery of sensation was detected in the G group. Groups G, O, and E had significantly less vasopressor need and lower incidence of nausea. In the cesarean section, prophylactic use of i.v. granisetron, ondansetron, or ephedrine reduced the severity of spinal-induced hypotension, nausea, and vasopressor need, but faster recovery of sensory block was noticed with granisetron. Spinal anesthesia is a popular technique for cesarean delivery as it is easy to perform and provides a rapid-onset, dense surgical block. It is not associated with maternal or fetal risk for toxicity to local anesthetics  , but it is associated with hypotension and bradycardia, which may be deleterious to both parturient and baby  . Various preventive methods are currently used to prevent or minimize hypotension, including left uterine displacement, crystalloids or colloid preloading, and utilizing compression stocking onto the lower extremities  . Hypotension results primarily from decreased vascular resistance, whereas bradycardia is secondary to a relative parasympathetic dominance, increased baroreceptor activity, or induction of the Bezold-Jarisch reflex (BJR)  . This reflex is elicited by stimulation of peripheral serotonin receptors 5-hydroxytryptamine (5-HT3 type). Current studies indicate that 5-HT3 antagonism may abolish the BJR response to spinal anesthesia  . Ondansetron and granisetron are selective 5-hydroxytryptamine 3 (5-HT3) receptor antagonists, and thus may be beneficial for preventing bradycardia and hypotension  . Ephedrine, an indirectly acting sympathomimetic amine, is probably the vasopressor of choice in obstetric anesthesia. Although ephedrine has mixed a-adrenoreceptor and b-adrenoreceptor activity, it maintains arterial pressure mainly by increases in cardiac output and heart rate as a result of its predominant activity on β1-adrenoreceptors  . This study aimed to compare a traditional vasopressor 'ephedrine' with 5-HT3 receptor antagonists 'granisetron' and 'ondansetron' in preventing hypotension of spinal anesthesia during cesarean section. After obtaining approval from the medical ethics committee and informed consent from all parturients, this comparative study was conducted in El-Minia University Hospital during the period from June 2013 to February 2014. Eighty parturients who were of ASA physical status I or II, aged 20-40 years, and undergoing an elective, cesarean section were included. Parturients with contraindications to subarachnoid block, who refused to participate, who had a history of hypersensitivity to the studied drugs, who had hypertensive disorders of pregnancy, and those receiving selective serotonin reuptake inhibitors or migraine medications were excluded. Parturients were randomly allocated into four equal groups of 20 patients each using a computer-generated randomization chart. The study was prospectively assigned in a double-blinded manner (neither the anesthetist who injected the drugs and recorded the parameters nor the patient knew the nature of the drugs given). Patients received intravenous (i.v.) 1 mg granisetron (G group), i.v. 4 mg ondansetron (O group), i.v. 10 mg ephedrine (E group), or 10 ml normal saline (C group). All the studied drugs were diluted to a total volume of 10 ml with normal saline by the author and supplied in similar syringes to the attendant anesthetist who was blinded to the studied medications to inject them 5 min before starting the subarachnoid block. The same anesthetist recorded the studied parameters. Parturients were evaluated before surgery and premedicated with i.v. ranitidine (1 mg/kg). In the operating room, baseline values of noninvasive blood pressure, ECG, and pulse oximetry (SpO 2 ) were recorded. A peripheral 18-G i.v. cannula was inserted into the dorsum of the nondominant hand and the patients were prehydrated with 5 ml/kg lactated Ringer's solution warmed to 37°C given over 15 min. After sterilization of the back, spinal anesthesia was induced at L3-L4, with the patient in the sitting position, with 2 ml of 0.5% hyperbaric bupivacaine (Marcaine; AstraZeneca, Sodertalje, Sweden) after confirmation of free flow of cerebrospinal fluid through a 25-G Quincke spinal needle (Typo Healthcare, Gasport, UK). The patients were then placed in the supine position with 15° left tilt. Intravenous fluids were restarted, and supplemental oxygen was delivered through a Venturi facemask at a rate of 4 l/min. Hemodynamic data [heart rate and mean arterial pressure (MAP)] were recorded at 5-min intervals until the end of surgery. Rescue i.v. bolus doses of 50 μg phenylephrine were given if the parturient became hypotensive (hypotension was defined as a decrease in MAP more than 20% from the baseline). The height of sensory blockade was assessed as the highest dermatome with loss of fine pinprick sensation at two consecutive times. Authorization for the surgical procedure was given only when the level of blockade reached T5. The time to upper sensory block (defined as the time between intrathecal injection and achievement of the highest level of sensory blockade), two-segment regression (defined as the time between achievement of the highest level of sensory blockade and its regression to a level two segments lower), and sensory regression to T10, T12, and S1 (defined as the time between achievement of the highest level of sensory blockade and its regression to a level of T10, T12, and S1, respectively) were recorded and analyzed. The Bromage scale was used to evaluate motor block every 2 min until complete motor block was achieved and then every 15 min until complete recovery ([Table 1]). Any complication such as bradycardia was treated with i.v. 0.5 mg atropine; nausea and vomiting were treated with i.v. 10 mg metoclopramide; and shivering was treated with i.v. 25 mg tramadol. The above complications, in addition to the need for vasopressor, were recorded and analyzed. The Statistical Program SPSS (SPSS Inc., Chicago, Illinois, USA) for Windows, version 20, was used for data entry and analysis. Quantitative data were presented as mean and SD, whereas qualitative data were presented as frequency distribution. Analysis of variance was used to compare the means between groups, followed by post-hoc analysis. The χ2 -test and Fisher's exact test were used to compare between proportions. The lowest accepted level of significance was 0.05 or less. The sample size was calculated by comparing the means of difference between groups by confidence interval 95% and study power 80%. Demographic data, ASA classification, and duration of surgery were comparable among groups ([Table 2]). There was no significant difference between the groups as regards basal MAP, but after induction of spinal anesthesia significant decrease in MAP was seen in all groups compared with basal MAP, with the least decrease occurring in the O group and the greatest in the C group. 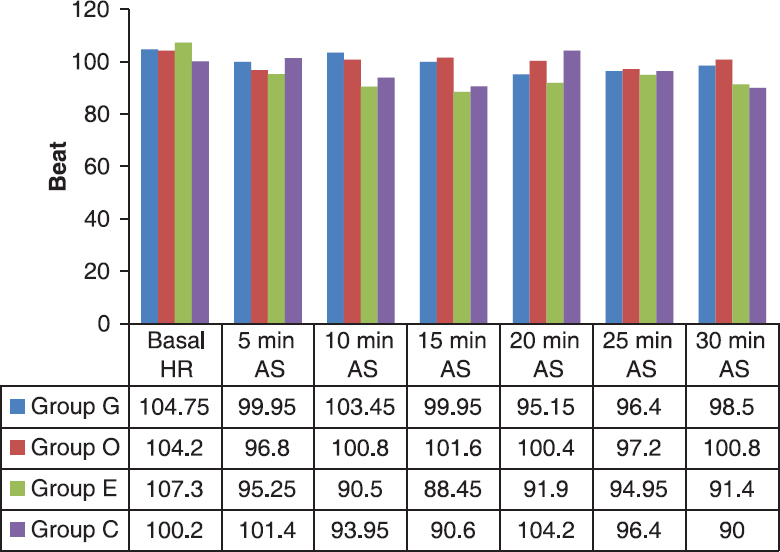 Those in group C had significantly lower MAP between 5 and 30 min in comparison with those in groups G, O, and E. On comparing group O with groups G and E, a significant difference was seen at 5, 10, and15 min but no difference was detected between groups G and E, except at 5 min ([Table 3]). Regarding the heart rate, no significant difference was detected between the groups except at 10 min (P = 0.001) and 15 min (P = 0.002), with a higher rate noticed in groups G and O, which were significantly different from both groups E and C ([Figure 1]). Figure 1: Comparison of heart rate (HR) (beats/min) in the studied groups. AS, after spinal. The time of fixation of sensory level was insignificant among the groups. However, significantly faster recovery of sensation down to the level of T12 was detected between group G and the other groups. The same finding occurred in the regression to S1, but did not reach statistical significance when comparing group G with group E ([Table 4]). No significant difference was present between the groups as regards onset of complete motor block (P = 0.624) or its regression (P = 0.591), until complete recovery (P = 0.919). On comparing the need for phenylephrine as a rescue vasopressor, significant difference was seen among the groups, with the greatest number of parturients who needed vasopressor being in group C and the smallest in group O; however, the time of first phenylephrine requirement was not statistically different ([Table 5]). Regarding the occurrence of nausea, statistical difference was present between the study groups, and also between each one of the therapeutic groups and group C.
Despite the small difference in the number of cases suffering from shivering in groups G, O, and E, significant difference was detected between group G and group C ([Table 5]). Finally, no significant difference was present in the incidence of bradycardia among the groups ([Table 5]). Spinal anesthesia for cesarean section may cause hypotension, which can jeopardize the fetus and the mother  . Prevention of maternal hypotension during spinal anesthesia may result in better outcomes compared with that following treatment after it has occurred  . In the present study, a traditionally used vasopressor in obstetric anesthesia, 'ephedrine', which is a noncatecholamine sympathomimetic agent that stimulates a- adrenergic and β-adrenergic receptors directly and predominantly indirectly, or two 5-HT3 antagonists, ondansetron and granisetron, as they block the BJR and may successfully treat postspinal hypotension, were used prophylactically and given 5 min before spinal blockade with additional 50 μg rescue boluses of phenylephrine if hypotension occurred in an attempt to prevent spinal-induced hypotension. To decide the doses of the studied drugs, previous studies were revised. With regard to ephedrine, no consensus was seen on the prophylactic i.v. ephedrine dose that prevents spinal-induced maternal hypotension. Loughrey et al. studied 68 parturients who received either 0.9% saline, 6 mg ephedrine, or 12 mg ephedrine. Further rescue boluses of 6 mg ephedrine were given if hypotension was reported. They concluded that a prophylactic bolus of i.v. ephedrine at 12 mg plus rescue boluses leads to a lower incidence of hypotension following spinal anesthesia compared with i.v. rescue boluses alone. Also, Vercauteren et al. evaluated the effectiveness of a prophylactic single i.v. dose of 5 mg ephedrine in patients prehydrated with 1000 ml of lactated Ringer's solution and 500 ml of 6% hydroxyethyl starch who received a small-dose spinal local anesthetic-opioid combination. Additional ephedrine boluses (5 mg) were administered i.v. when hypotension occurred. Their findings suggest that this dose decreases the occurrence and limits the severity of maternal hypotension. In previous studies, a low dose of hyperbaric bupivacaine with intrathecal opioids and a large volume of prehydration were used, which led to less cardiovascular instability that could be managed even with low doses of prophylactic i.v. ephedrine. In the present study, a standardized dose of hyperbaric bupivacaine, without any intrathecal opioids, was used for spinal anesthesia to get effective block height, which is associated with greater hemodynamic changes. Therefore, 10 mg of ephedrine was selected and given 5 min before spinal anesthesia with 50 μg rescue boluses of phenylephrine if hypotension occurred, as well as to avoid the hazardous effect of high doses of ephedrine on the fetus and prevent reactive hypertension. The important finding in this study is that, despite the reduction in mean blood pressure in the three therapeutic groups, it still less than that in group C, with significant difference recorded, with the least reduction in mean blood pressure detected in group O and the greatest in group C. Although significant differences in heart rate were observed between the groups on two occasions at 10 and 15 min, with higher rates noticed in groups G and O, the difference was too small to achieve statistical significance at the remaining time points. These findings agree with those of Tsikouris et al. , who observed that infusion of granisetron diminished heart rate fluctuations and decreased systolic blood pressure changes during head-up tilt table tests, which are likely related to the BJR. Further, in the study by White et al. administration of granisetron significantly attenuated the decline of heart rate and blood pressure in rabbits. In line with our results, Marashi et al. found that two different doses of i.v. ondansetron, 6 and 12 mg, significantly attenuated spinal-induced hypotension and bradycardia compared with the control saline group. Also, Sahoo et al. concluded that i.v. ondansetron at 4 mg given prophylactically can attenuate the decreases in blood pressure following spinal anesthesia. The study by Owczuk et al. reported that 8 mg i.v. ondansetron attenuates the fall of systolic and mean blood pressure but does not have an influence on diastolic blood pressure or heart rate. In contrast to the present study, Mowafi et al. and Rashad and Farmawy  found that i.v. granisetron administration had no effect on hemodynamic variables. In addition, the study by Ortiz-GÓmez et al. showed that prophylactic ondansetron at 2, 4, or 8 mg i.v. had little effect on the incidence of hypotension in healthy parturients undergoing spinal anesthesia with bupivacaine and fentanyl for elective cesarean delivery. With respect to the effect of ephedrine on hemodynamics, this study agrees with that of Magalhγes et al. , as a dose of 10 mg of ephedrine was considered to be effective in the prevention of hypotension and, at the same time, had little side effects. As mentioned before, no consensus was found for the dose. Thus, Iqbal et al. found that a 15 mg bolus dose of prophylactic i.v. ephedrine can effectively prevent spinal-induced maternal hypotension without adverse effects like reactive hypertension. In contrast, Adigun et al. found that ephedrine at 5 mg effectively restored both the systolic and the diastolic blood pressure during elective cesarean section under spinal anesthesia. On evaluating the effect of the studied drugs on motor and sensory blockade, the groups were not significantly different considering the motor block or recovery. Also, no difference were found regarding onset of upper sensory blockade; however, faster recovery of the sensory blockade was found in the granisetron group. These findings agree with prior studies by Mowafi et al. and Rashad and Farmawy  as they concluded that i.v. granisetron facilitated the recovery of sensory block after bupivacaine subarachnoid anesthesia. Marashi et al. did not observe any significant changes in sensory block on using two different doses of ondansetron. Further, Samra et al. concluded that i.v. ondansetron does not affect the intensity or duration of sensory and motor block after spinal anesthesia with hyperbaric bupivacaine. In contrast, Fassoulaki et al. reported that ondansetron antagonizes the sensory block, but they used hyperbaric lidocaine in their study. The differences between the effects of ondansetron and granisetron on sensory blockade, although both are from the same category and have the same mechanism of action as explained by previous studies , , may be due to the action of ondansetron on mixed receptors and the high selectivity of granisetron on 5-HT3 receptors with little or no affinity for other receptors  . Regarding the need for rescue vasopressor and occurrence of nausea, the present study found that the three studied drugs reduced the phenylephrine requirement and decreased the incidence of nausea. As granisetron and ondansetron are used primarily for prophylaxis or treatment of postoperative nausea and vomiting, many studies support our results in this aspect: Gigillo et al. concluded that both granisetron and ondansetron have similar antiemetic efficacy for prophylaxis of chemotherapy-induced nausea and vomiting and Gupta et al. found that both granisetron and ondansetron are superior to metoclopramide for prophylactic therapy for postoperative nausea and vomiting (PONV). Regarding ephedrine, our results agree with those of Datta et al. , who compared early administration of ephedrine at 10-30 mg as soon as any fall in basal blood pressure was detected with i.v. boluses of 10 mg ephedrine, which was with-held until hypotension occurred. They found that early administration of ephedrine had less nausea alone or with vomiting. In contrast, Jabalameli et al. concluded that the most effective method for prevention of hypotension was administration of crystalloid preload plus ephedrine, but there was no significant effect on the severity of nausea. On evaluating the occurrence of shivering, it was found that all of the studied drugs reduced shivering in comparison with the placebo group; however, it was statistically significant only in the granisetron group. These results are supported by the findings of Iqbal et al. , in which prophylactic use of granisetron (40 μg/kg) and pethidine (25 mg) i.v. was effective in preventing postoperative shivering. Our results were also similar to the findings of Shakya et al. , who suggested that the prophylactic administration of low-dose ketamine (0.25 mg/kg) and ondansetron (4 mg) produces significant antishivering effect in comparison with placebo in patients undergoing spinal anesthesia and that ketamine (0.25 mg/kg) is significantly more effective than ondansetron (4 mg). El-Deeb and Barakat  found that prophylactic use of low-dose ephedrine is as effective as meperidine for shivering prophylaxis in women undergoing cesarean section under spinal anesthesia. Moreover, it is associated with less hypotension, nausea, and vomiting. Prophylactic i.v. use of 1 mg granisetron, 4 mg ondansetron, and 10 mg ephedrine reduces the severity of spinal-induced hypotension, the need for rescue vasopressor, and incidence of nausea, but faster recovery of sensory block was noticed with granisetron. One of the limitations of this study are that Apgar scores of newborns were not recorded as ephedrine has a dose-related propensity to depress fetal pH, but our primary focus was the effect of these drugs on maternal hemodynamics and sensory and motor blockade of spinal anesthesia. Also emergency and complicated patients were not included. Finally, postoperative nausea and vomiting, pain, and analgesic requirement were not studied. Loubert C. Fluid and vasopressor management for Cesarean delivery under spinal anesthesia: continuing professional development. Can J Anaesth 2012; 59:604-619. Sahoo T, SenDasgupta C, Goswami A, Hazra A. Reduction in spinal-induced hypotension with ondansetron in parturients undergoing caesarean section: a double-blind randomised, placebo-controlled study. Int J Obstet Anesth 2012; 21:24-28. Cyna AM, Andrew M, Emmett RS, Middleton P, Simmons SW. Techniques for preventing hypotension during spinal anesthesia for cesarean section. Cochrane Database Syst Rev 2006; 18:4. Liu SS, McDonald SB. Current issues in spinal anesthesia. Anesthesiology 2001; 94:888-906. Matthew D, Phillip L, Joseph P, Tyler Wi. Ondansetron given intravenously to attenuate hypotension and bradycardia during spinal anesthesia in Cesarean delivery: a literature review. Oakland University 2012; 4-10. Available from: https://oaklandcrna.files.wordpress.com/2012/05/zofran-4-10-ama.pdf. Van Wijngaarden I, Tulp MT, Soudijn W. The concept of selectivity in 5-HT receptor research. Eur J Pharmacol 1990; 188:301-312. Critchley LA, Stuart JC, Conway F, Short TG. Hypotension during subarachnoid anaesthesia: haemodynamic effects of ephedrine. Br J Anaesth 1995; 74:373-378. Bromage PR. Epidural Analgesia, Philadelphia: WB Saundersted; 1978. Klöhr S, Roth R, Hofmann T, Rossaint R, Heesen M. Definitions of hypotension after spinal anesthesia for cesarean section: literature search and application to parturient. Acta Anaesthesiol Scand 2010; 54:909-921. Khan M, Nisai-ul-Waqar, Farooqi A, Ahmad N, Qaz S. Crystalloid co-load: a better option than crystalloid pre-load for prevention of postspinal hypotension in elective cesarean section. Internet J Anesthesiol 2013; 32:1. Loughrey JP, Walsh F, Gardiner J. Prophylactic intravenous bolus ephedrine for elective Caesarean section under spinal anaesthesia. Eur J Anaesthesiol 2002; 19:63-68. Vercauteren MP, Coppejans HC, Hoffmann VH, Mertens E, Adriaensen HA. Prevention of hypotension by a single 5-mg dose of ephedrine during small-dose spinal anesthesia in prehydrated cesarean delivery patients. Anesth Analg 2000; 90:324-327. Tsikouris JP, Kluger J, Chow MS, White CM. Usefulness of intravenous granisetron for prevention of neurally mediated hypotension upon head upright tilt testing. Am J Cardiol 2000; 85:1262-1264. White CM, Chow MS, Fan C, Kluger J, Bazunga M. Efficacy of intravenous granisetron in suppressing the bradycardia and hypotension associated with a rabbit model of the Bezold-Jarisch reflex. J Clin Pharmacol 1998; 38:172-177. Marashi SM, Soltani-Omid S, Soltani Mohammadi S, Aghajani Y, Movafegh A. Comparing two different doses of intravenous ondansetron with placebo on attenuation of spinal-induced hypotension and shivering. Anesth Pain Med 2014; 4:e12055. Owczuk R, Wenski W, Polak-Krzeminska A, et al. Ondansetron given intravenously attenuates arterial blood pressure drop due to spinal anesthesia: a double-blind, placebo-controlled study. Reg Anesth Pain Med 2008; 33:332-339. Mowafi HA, Arab SA, Ismail SA, Al-Ghamdi A. The effects of intravenous granisetron on the sensory and motor blockade produced by intrathecal bupivacaine. Anesth Analg 2008; 106:1322-5. Rashad MM, Farmawy MS. Effects of intravenous ondansetron and granisetron on hemodynamic changes and motor and sensory blockade induced by spinal anesthesia in parturients undergoing cesarean section. Egypt J Anaesth 2013; 29:369-374. Ortiz-Gómez JR, Palacio-Abizanda FJ, Morillas-Ramirez F, Fornet-Ruiz I, Lorenzo-Jiménez A, Bermejo-Albares ML. The effect of intravenous ondansetron on maternal haemodynamics during elective cesarean delivery under spinal anaesthesia: a double-blind, randomised, placebo-controlled trial. Int J Obstet Anesth 2014; 23:138-143. Magalhães E, Govêia CS, de Araújo Ladeira LC, Nascimento BG, Kluthcouski SM. Ephedrine versus phenylephrine: prevention of hypotension during spinal block for cesarean section and effects on the fetus. Rev Bras Anestesiol 2009; 59:11-20. Iqbal MS, Ishaq M, Masood A, Khan MZ. Optimal dose of prophylactic intravenous ephedrine for spinal-induced hypotension during cesarean section. Anaesth Pain Intensive Care 2010; 14:71-75. Adigun TA, Amanor-Boadu SD, Soyannwo OA. Comparison of intravenous ephedrine with phenylephrine for the maintenance of arterial blood pressure during elective caesarean section under spinal anaesthesia. Afr J Med Med Sci 2010; 39:13-20. Samra T, Bala I, Chopra K, Podder S Effect of intravenous ondansetron on sensory and motor block after spinal anaesthesia with hyperbaric bupivacaine. Anaesth Intensive Care 2011; 39:65-68. Fassoulaki A, Melemeni A, Zotou M, Sarantopoulos C. Systemic ondansetron antagonizes the sensory block producedby intrathecal lidocaine. Anesth Analg 2005; 100:1817-1821. Aapro M. Granisetron: an update on its clinical use in the management of nausea and vomiting. Oncologist 2004; 9:673-686. Del Giglio A, Soares HP, Caparroz C, Castro PC. Granisetron is equivalent to ondansetron for prophylaxis of chemotherapy-induced nausea and vomiting: results of a meta-analysis of randomized controlled trials. Cancer 2000; 89:2301-2308. Gupta V; Wakhloo R; Lahori VU; Mahajan MK; Gupta DS. Prophylactic antiemetic therapy with ondansetron, granisetron and metoclopramide in patients undergoing laparoscopic cholecystectomy under general anaesthesia. Internet J Anesthesiol 2007; 14:1-5. Datta S, Alper MH, Ostheimer GW, Weiss JB. Method of ephedrine administration and nausea and hypotension during spinal anesthesia for cesarean section. Anesthesiology 1982; 56:68-70. Jabalameli M, Soltani HA, Hashemi J, Behdad S, Soleimani B. Prevention of post-spinal hypotension using crystalloid, colloid and ephedrine with three different combinations: a double blind randomized study. Adv Biomed Res 2012; 1:36. Iqbal A, Ahmed A, Rudra A, Wankhede RG, Sengupta S, Das T, Roy D. Prophylactic granisetron vs pethidine for the prevention of postoperative shivering: a randomized control trial. Indian J Anaesth 2009; 53:330-334. Shakya S, Chaturvedi A, Sah BP. Prophylactic low dose ketamine and ondansetron for prevention of shivering during spinal anaesthesia. J Anaesthesiol Clin Pharmacol 2010; 26:465-469. El-Deeb A, Barakat R. Could ephedrine replace meperidine for prevention of shivering in women undergoing Cesarean section under spinal anesthesia? A randomized study. Egypt J Anaesth 2012; 28:237-241. 2 Does Ondansetron Modify Sympathectomy Due to Subarachnoid Anesthesia?